Alliance staff gather for some quality time together the Saturday evening of the Forum. 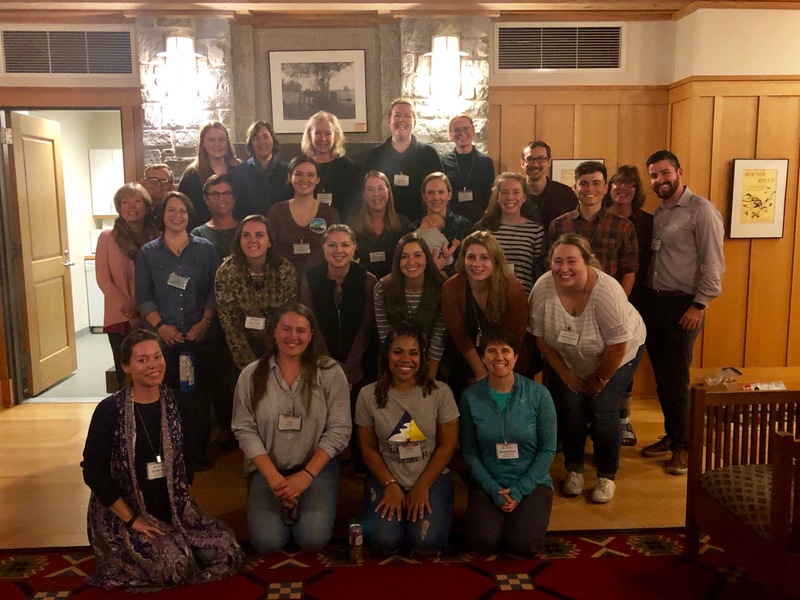 The 2018 Chesapeake Watershed Forum was a whirlwind of workshops, socializing, getting lost in the yellow covered forest, and learning about what brings us all together. I am a Chesapeake Conservation Corps (CCC) member at the Alliance for the Chesapeake Bay. This meant that I was not only helping out with some of the organization of the Forum and getting a chance to bond outside of a work setting with my co-workers, but I was also finally getting a chance to talk to my fellow CCCers and learn about what they have been working on at their host sites. However, most importantly I was learning. Probably my favorite part of the Forum was the Opening Plenary. 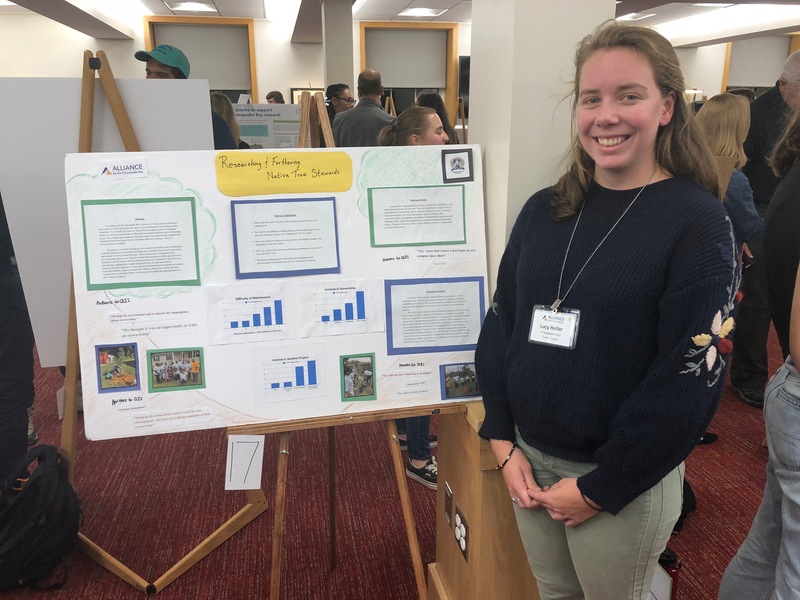 Jenny McGarvey, from the Alliance’s Richmond office was able to help our science-focused brains connect with the broader picture of why we started working in this field, and brought us back to why we love the Chesapeake watershed. She showed us a few of the many ways that there are to express this history and importance, through different forms of art. For example, Jeff Holland sang a song about chicken necking, which helped jog my memory to when I was six years old at crab camp. Jenny taught us how to draw a cognitive map, representing the specific image you see when you think about the reason you got into the environmental field. It was amazing to see everyone’s stories and how different their drawings were. From there, we all went our separate ways to find the workshops that best fit our interests and curiosities. Each workshop I attended boosted my hopes for working on not only my personal goals, like the confidence I learned to uphold during the “”Implicit Bias and Gender in Conservation” workshop, but also big picture projects during workshops such as; “Putting Collective Impact into Action,” “Community Based Social Marketing for Behavior Change,” and “Mobilizing Congregations.” All the workshops I attended helped me connect to the bigger picture of the Forum, which was connecting our communities, and celebrating diverse and innovative partnerships. I became aware of my personal responsibilities of getting a job done, but that I also won’t be able to do it without help from others, whether that be coworkers, community members, businesses, or congregations. The Chesapeake Collective was also a major part in helping our individual voices at the Forum come together as one. The group had projects set up around the National Conservation Training Center campus that were made to foster a creative platform for diverse voices to express their vision and interest for a healthy Chesapeake watershed. Projects included observations with pictures that told people’s stories, contribution through community boards, letter writing, and art, and through bigger participation in projects such as the field session. The field session led by the Chesapeake Collective taught lessons on diversity and privilege. We dove into conversations on what separates us, but what also brings us together. We learned how it can be easy to be blinded by our privileges and forget to notice our surroundings, all while participating in fun and informative activities. While we learned how to work better together by being more aware, we also learned to have fun together. In the evenings there was great opportunities for socializing and meeting new people, through mingle bingo (mingo), poster sessions, the bar, fireside chats, and my personal favorite − musical jamming. The poster session was another highlight for me. I loved showing off a part of the work I’ve been doing at the Alliance as well as learning what other Corps members and some professionals have accomplished. It was a great feeling having people genuinely interested in wanting to hear more about my work. Presenting my project during the poster session on Saturday evening of the Forum. Sunday morning to close out my time at the beautiful campus, I participated in the Forest Bathing exercise. Before our walk, the leaders of the exercise had us write down something we wanted to think about while on the walk. 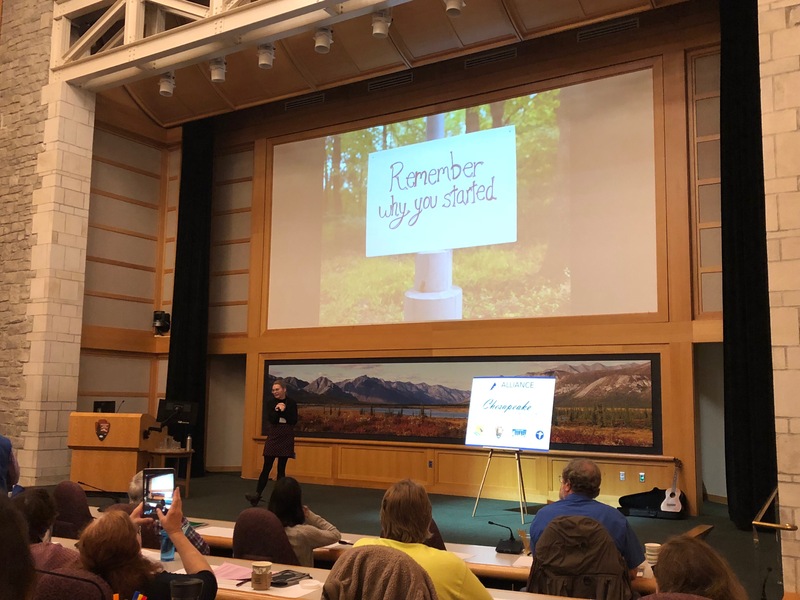 I wrote “to remember why I am here and to fully absorb my surroundings.” Getting a chance to take a step back from the craziness of the Forum and to fully embrace nature reminded me of the cognitive map exercise. We all have a seperate reasons for attending the Forum, but those reasons are what bring us together and that’s why it is important to share and learn from others.